For a while I have been planning to write about the consequences of artificial intelligence and the need for a political discussion about Basic Income. So when I saw Albert Wenger’s video on Basic Income from last week’s DLD conference I decided to spend my Sunday evening with a glass of wine and my laptop and finally get this post out. “Though many doctors will not like this thought, any test that requires pattern recognition will ultimately be done better by a machine than by a human. Some people believe that new jobs will be created when old jobs go away. Their argument is that this has always happened in the past when jobs disappeared because of a new technology, and why would it be different this time? Well, unfortunately for them this time technology does not affect just one category of work (like in the past), but potentially most jobs that we currently have. Even newly created job categories (whatever they are) might soon be disrupted by artificial intelligence. Even many scientists don’t seem to understand that the time of linear growth is over, we are now seeing exponential change in technology, which means that humans won’t have time to adapt. Technological change will be faster from now on. It’s maybe hard to imagine right now, but I believe my kids will likely never have a real job (in terms of working full-time for more than one year for a company in one location). They are 6 and 8 years old right now. When they are done with university 15 years from now I believe society will have changed. Of course there are still companies, but they will have a lot less employees than nowadays. Most of the work will be done by robots (in any form) instead of people. Take a restaurant for example, likely cooks will be replaced by robots that can cook excellent dishes and may even come up with better recipes. Don’t believe me? Next year a robot will go on sale that can cook 2000 dishes at the touch of a button. And the first cook book written by artificial intelligence is already available. Do you think you’ll be served by robots or by servers? It depends on how much you want to pay. I expect that in high-end restaurants you’ll still have human servers, but if you want a great but less expensive meal a robot may bring the food to your table and refill your wine glasses. I can give tens of examples of how jobs will be disrupted, but I won’t do that here. I have been thinking about this for years and my conclusion is that only arts and sports will likely not be disrupted by machines, and that human service will be something that’s available only at a premium. Is this a problem? Yes, if you look at it from today’s perspective, because everything in society is about work right now. People are expected to have jobs, that’s why most people go to school and university. Most people don’t study what they really love, but choose subjects that they can get a good job with (I don’t think any law students starts law school because he or she is passionate about it, although that may change after a while. Full disclosure, I studied law for 2 semesters next to studying economics). So the education system that we have right now will have to change. But also people’s expectations will have to change, you can’t expect to have a full time job anymore when you finish your studies. But because most people will be without a formal job the norm will change. The social stigma of unemployment will disappear and not having a job will become a normal thing. My expectation is that most companies will transform into platforms where you can work for a few hours whenever you want. Something like Uber, where you can use your car as a taxi for a few hours per day or week to earn some extra income. However, the biggest problem will be that people can’t survive without money. I am very worried about the transition period from full employment to almost full unemployment, a period that has started already. People need to take care of their families and will become desperate if they can’t provide for them. This will lead to social unrest and crime, and this could start much sooner than politicians are willing to acknowledge. But there is a solution, and that is Basic Income. Over the past 2 years I have become convinced that Basic Income can solve most of these problems and can lead to a very bright future for humanity. How does it work? For me Basic Income means that anybody, old or young, rich or poor, would get an income that would be sufficient to survive on. For Canada and the US that would be something like $1000 per person per month. Enough to have food, Internet and housing, but not much more than that. Everybody will get this, whether your have a job or not, or whether you just won the lottery or are a homeless person. Basic Income should replace the current social system, so no unemployment payments or social security anymore, but only this monthly income. The problem with the current system is that it does not encourage you to find a job, because you will lose your benefits if you find a job. With Basic Income you’ll keep your monthly payments, so everything you earn will be on top of it. Won’t people get lazy and just watch YouTube videos the whole day instead of looking for a job? Possibly, but that’s fine. Basic Income gives you the choice to do with your life whatever you want to do. You can find or create work so that you’ll have more to spend, but if you think the Basic Income is sufficient and you want to stay home that’s okay as well. My expectation is that most people will do something useful with their free time if they know they can survive on their Basic Income, but there will always be people who will are happy not to do anything. As mentioned before, platforms will become the new companies. Anybody can work on one or more platforms or marketplaces at the same time to earn some additional cash and to do something that they may enjoy. Do you like cooking? Very likely platforms will come up where you can sell your home-cooked meals to others (delivery by drone anyone?). Are you good at playing piano? You can teach anybody in the world through new virtual reality platforms, with automatic payment per minute in a cryptocurrency. Do you have a boat? Others can rent it from you (with or without you as a skipper) on another platform. That’s what the world might look like, and a Basic Income can make this happen. You have enough to live a reasonable life and have unlimited free time to do whatever you like to do. Afraid to do a start-up? With Basic Income the hurdle will be a lot lower because you will always survive if you go bankrupt. Without Basic Income marketplaces may pay less and less (you can already see that with Uber right now), but Basic Income will give more bargaining power to workers. It may also solve the current US discussion about minimum wages. When people have enough to survive it is likely that they don’t want to work for $10 an hour anymore, so if companies like McDonalds are still around they are forced to increase their wages to get people to work for them. Life with Basic Income will be one where people have a lot more time for themselves and where they can make choices what they want to do with it. I expect that more people will do volunteer work for example, or that they will only do work that they like to do. And people will educate themselves, they will study what they really like and use their knowledge to help others or to sell it on platforms. My expectation is that prices for goods will fall because of robotics, so life will be a lot cheaper. Not only food and daily necessities, but also the cost of transportation. Electric vehicles will be shared and will likely cost less than 10 dollars per day for unlimited transportation. How? A basic electric car will cost $10K when it’s mass produced, will last for 5-10 years and has hardly any additional costs because of free solar power. Just do the math. Entertainment is already mostly free because of the Internet. Videos you can find online for free on YouTube or for a small monthly fee on Netflix. All music and radio stations are available on Spotify and for books Kindle Unlimited gives you a huge collection to read. Platforms like Coursera will make education virtually free as well, so as long as you have access to Internet nobody will have to be bored anymore. How can we pay for this? If you replace the current system in the US with a basic income system it means that the cost to implement it will be less than 10% of gross output. That is something that can be financed. However, when less people have jobs it also means that income and capital gains taxes will have to be increased. You will start paying higher taxes from the moment you earn additional income, although I would expect that a system would likely mainly affect higher income groups. For more details on this and how Basic Income can even lead to lower taxes see this article in the Huffington Post. Possibly there will be a few companies that will get most of the revenues in the future. These are the companies that develop artificial intelligence and own the robots. I would not be surprised if corporate taxes could go up to 80-90% to make up for the job losses that they cause. I now already invest in the potential winners of the future such as Google and Amazon, they may not only be the first trillion dollar companies, but if AI takes off even the first multi-trillion dollar companies. Most other companies won’t survive, so they will have to finance the majority of the cost of Basic Income. For most people Basic Income may sound like something out of a communist country, but it really isn’t. In a classic communist system you are told what kind of work to do and how much you get paid for it (a low amount that is similar for most people). Basic Income instead gives you the freedom to do with your life what you want to do with it. 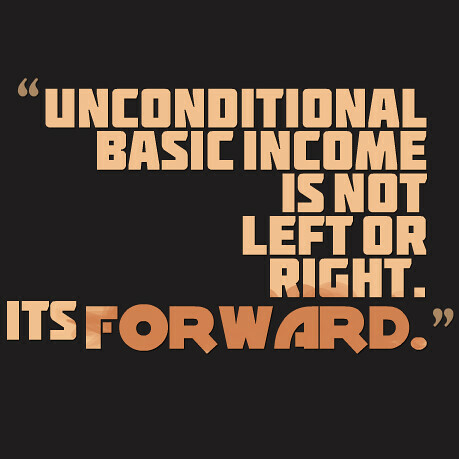 I believe the future could be quite bright if Basic Income would be implemented. I believe that because of AI we will have a world of abundance and in such a world time is the most important thing. Because of AI we will all have more time and Basic Income will make people less afraid of automation. It will give people options: do you not like your job? Now you can walk away from it. Or even more radical, if a housewife doesn’t like her spouse her options might currently be limited because of money, but with basic income she may have the option to choose a better life. It will take some time for politicians to wrap their heads around the idea, but I think they will eventually see the benefits it will bring to society. I am a capitalist (although a fairly liberal one), but I believe that the not-so-much-capitalist idea of Basic Income is needed to ensure a good future for anyone. I am not yet sure how we will get there, but I hope this post will get some people thinking. Some countries are already taking a serious look at Basic Income, for example Finland and Switzerland. I expect that Europe will be the first continent where most countries will start to implement some sort of Basic Income. China might also be a good candidate, especially when the party is worried about unrest once unemployment starts going up. The US won’t be in the first group, but once it sees the results of Basic Income in other countries it may change its mind. Obviously there is a lot more to say about Basic Income, but these are the main arguments that people should consider when thinking about this subject. I hope we will see Basic Income before mass unemployment will hit all of us. Very interesting article and I couldn’t agree more. It will give people the chance to do what they really like and by that also increase their basic income. But there may always be some jobs that could be better done by humans and not only the best jobs, but maybe boring , menial jobs as well that will not be automated. Probably no one at all would be interested to do these. What are your thought s on that? I guess they have to be made attractive and pay a lot to make people want to do this? In which case that would not be a bad development. Thanks for the link Lylke, interesting results! The labour market is based on supply and demand, so if there is no interest in doing certain jobs the price (=wages) will have to go up. Very interesting article, thank you for taking the time to think about and write down your thoughts, and thank you also for having the magnanimity to suggest that the poor should be allowed to live well. I too have been thinking a lot about this. I think there is a lot to discuss, but I will try to keep it brief. 1) What do you think about the fate of computer programmers and product managers? Will AI replace them by programming itself better and faster, and knowing what to build better and faster? If so, then exponential growth will continue to compound and accelerate by orders of magnitude. I think that this is likely. And only 5-10 years away. Do you know of many people/companies working on this? I once read a study involving using AI to let FPGAs solve problems themselves and finding completely unexpected results – the FPGAs ended up using non-binary voltages. Unfortunately I can’t find the source anymore. 2) Regarding Taxation, I do agree that the tax code will have to change. One of the most aggravating aspects of the taxcode now is that common citizens (those earning less than, say, 200K per year), are barely able to accumulate wealth, while the wealthy are able to compound it, and seek haven for it. 3) My son is due to be born in May. It’s scary to think about the old adage: “In the short term, things change slower than we expect. but in the long term, changes are much faster. With moores law continuing, even this basic definition of long term will continue to shrink at an ever faster pace. I sincerely hope that over the longer-term waves of consolidation and the creation of super-wealth we are seeing, leaders can plan for the massive replacements of workforces, rather than simply look out for oligarchies. Do you think there is anything common citizens can do to help influence this process? It seems now, as a member of the upper-middle class – that my only chance to not be extremely poor in 10-20 years is to take big bets now, to start another company or be an early employee, otherwise, me and my progeny will forever be relegated to the underclass. At a certain point, there will be no way out. It is interesting to read an article about this topic. The first time I heard about Basic Income was a year ago when I saw an episode of You might have seen it already. I do think we will go to a future with a lot more robotization and artificial intelligence, but do you really think it will enter that quickly? Take for example the e-commerce, where in the Netherlands after 15 years of e-commerce still 10,5% of all sold products went through an online channel. Obviously, there are also other elements which are fully digitalized by the internet. Have a good evening! Keep writing! First of all nice reading. I like the subject you choose. Eight months ago I heard for the first time about it in a documentary from ‘Tegenlicht – Gratis Geld’ http://www.npo.nl/gratis-geld/21-09-2014/VPWON_1219695. This documentary highlights an experiment held in the 1970’s called ‘Mincome’ (https://en.wikipedia.org/wiki/Mincome), whereby the results never have been studied till 2009. The results seemed to be quite successful on subjects as reducing costs for healtcare, more graduated students, happiness of people, and more. But I do have a question. What do you understand with 10-15 years high and low-level jobs will be replaced? The internet has already done a fenominal job in the lasts 20 years, but for example still 10,2% of the sold products went through an online sales channel (of course the internet has interrupted other industries completely). In what size or scale do you expect the consequences of these developments? Have a good evening! Keep writing!ce reading. I like the subject you choose. Eight months ago I heard for the first time about it in a documentary from . This documentary highlights an experiment held in the 1970’s called , whereby the results never have been studied till 2009. The results seemed to be quite successful on subjects as reducing costs for healtcare, more graduated students, happiness of people, and more. @Alex Miller: 1) I believe most programming jobs might be taken over by AI eventually. You’ll always need programmers to make sure AI can be stopped (although this may be impossible because AI will be so much smarter than we are, and be able to second guess what human programmers may try to do to stop it). 2) Taxation should be skewed towards higher incomes. But with basic income at least the first $12K will be tax free already. I think corporations will pay an AI tax in the future, for example based on how much money they save by not employing people. 3) One thing you can do is vote for people that believe in basic income or other income redistribution models. And spread the word: Talk to others about the idea, write about it online etc. Or become a politician yourself! @Rene: I believe that most jobs can (and will) be replacement by articifical intelligence. Computers get exponentially better and faster, meaning that lots of jobs that now seem safe can be at risk in 10-15 years. Suddenly computers will be so good that they can do almost any job that at this point only humans can do. It doesn’t mean that all goods will be sold online, but likely you won’t see many humans working in supermarkets anymore. What do you think of the YCombinator initiative, researching basic income effects? In what way would researching basic income effects be interesting to an investor like yourself?